The winner of 2016 Onslow Contracting Western Australian Rally Championship (WARC) Dylan King and co-driver Lee Tierney have taken a clean sweep of the MRF Tyres Boddington Rally winning every stage. Competitors tackled eight stages, a total of 130.72 competitive kilometres in and around Boddington last Sunday (3rd June 2018) in the third round of the WARC. Making his WARC comeback, King said that the Safari the first rally in their new Subaru Impezza WRX STI. “We had a brand new car that had never been on gravel before so it was a big test for us,” King said. “Our aim was to the finish the rally. We didn’t have any other goal, we just wanted to do our own rally and test the car, see what it was capable of and it paid dividends. But wasn’t without challenges. “We had a disaster in the last stage that was 30 kilometres long – we went into it with a big lead but 1.5 kilometres into it, the gearbox got stuck in third gear and we had to make a decision – to stop or keep going. We kept going – we limped through the next 28 kilometres in third gear, which wasn’t easy with hairpin bends. Despite the dramas in Stage 8, King / Tierney won it by just 0.6 of a second over John O’Dowd. “We’re over the moon, the whole team has put a lot of effort in so a big thanks to them and to NatRad Malaga for all their help,” King said. King said that rebuilding the car has already commenced in order to be ready for the next round. Finishing in second place 1:48 minutes behind King was WARC leader John O’Dowd who had new co-driver Toni Feaver calling the notes in a Maximum Motorsport Subaru Imprezza WRC STI. O’Dowd said it was a really pleasing result. “Toni Feaver was co-driving with me for the first time. She is very experienced and really professional in the way she goes about things. I’ve been really lucky to have Kenneth (Sheil), Tom (Wilde) and now Toni in the car with me this year,” O’Dowd said. Finishing in third place outright 8 seconds behind O’Dowd was WARC championship contender, Stephen Oxley and Michael Wood in their Mitsubishi Lancer. Mid-way through the WARC and O’Dowd has extended his lead with at total of 244 championship points over Oxley who sits on 206 points. Safari winner King didn’t compete in the first two rounds so isn’t in WARC contention. 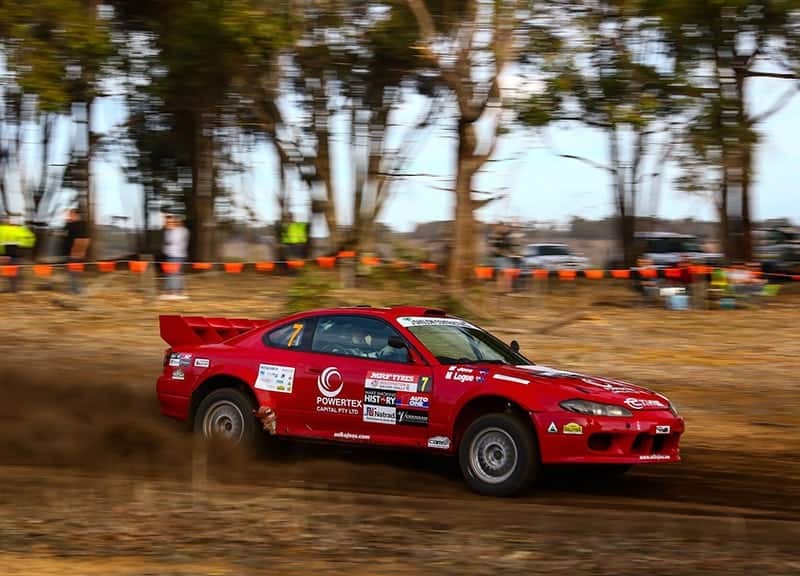 In the WARC 2WD category, Michael Joss and Megan Logue finished fasted in their Nissan Silvia S15, 1:13 minutes ahead of Alex and Lisa White in a Nissan Silvia S13, followed by Shane Eather and Ross Burton in their Datsun 200B who round out the top three. Joss / Logue won six of the eight stages and narrowly missed out on a clean sweep finishing a close second in the other two stages by 5 seconds and 1.5 seconds. Joss said that they had a great event and were happy with the car. “We lost the good engine last event, so were down on power this time, so I’m very happy with the result,” Joss said. “The roads were very challenging, from lots of tight slow corners to a long fast blast along a fence line, very smooth sections and parts that were quite rough. “It was another great rally and we are looking forward to the next one,” Joss said. The 2WD Championship leader White has gained valuable points and sits on 212 points over nearest rival Razvan Vlad on 134 points; Vlad did not compete in the Safari Rally. In third place in the Championship is Mike Young who also didn’t compete in the event. In the Clubman Cup, competitors compete half the length and distance of the WA State Rally Championship competitors, a total of 65.36 competitive kilometres. Clubman Cup 2018 season leader, husband and wife team Graeme and Kathy Miles in a Mitsubishi Lancer, took top honours in their class in Boddington, finishing fastest overall without taking a stage win. The 64-year-old said that it this event was redemption. “We only won Safari because we can change tyres quickly!” said Miles. “In the last five kilometres we suffered a flat tyre and only drove about one kilometre before stopping to quickly change it, which is what I think got us the win. “The Lancer is a really easy car to drive, it’s competitive and we had three stage finishes within seconds of each other – I love having close competition, that’s what I really enjoy about rallying. “The stages were slippery with gravel, with no where near the amount of traction as some other events – it’s the careful people that finish the rally,” Miles said. 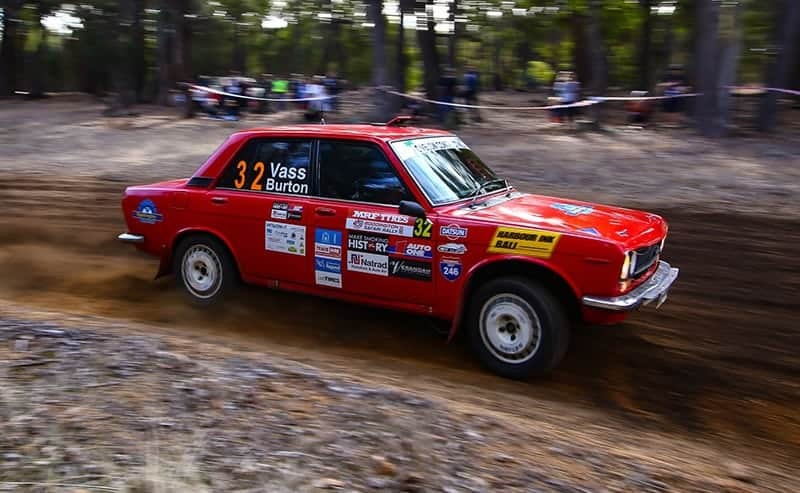 Finishing Boddington in second place was Stephen Vass and co-driver Ashley Burton in a Datsun 1600 and Timothee Bayer and Garry McCagh finished third in a Hyundai Excel. The win has seen Miles has extended his lead in the Clubman Cup to 216 points over Vasse on 170 points and Bayer is in third place on 112 points. “Now we’re leading, I’ve got to race the whole year or someone else will win the championship!” said Miles. Miles, who is also a CAMS official scrutineer for the V8 Supercars, said that rallying a 2WD is his retirement fun. 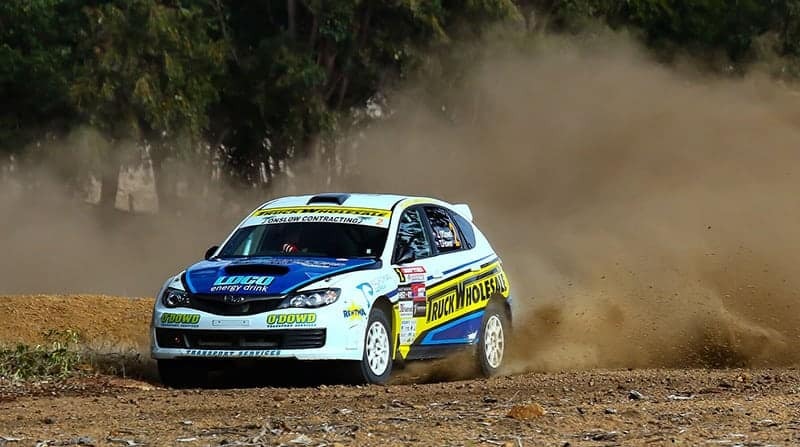 Round four of WARC is the Wheels on Yirrigan Kumho Tyre Kirup Stages, based around Kirup in the south of WA on Saturday 7 July.